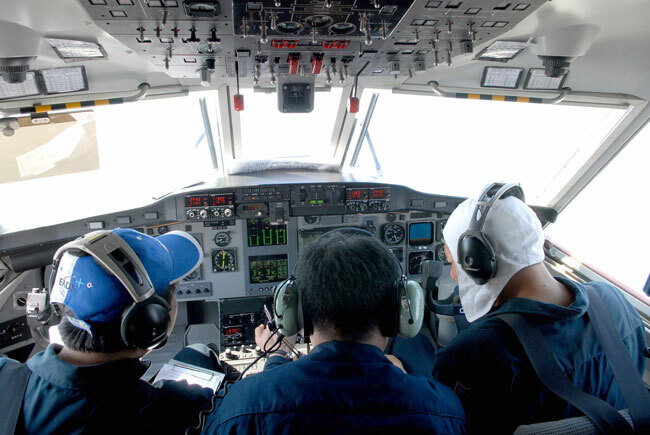 PHU QUOC (VNS) — Viet Nam is continuing search operations for the missing Malaysian plane, as it has for the last four days, said its navy's deputy commander, Rear Admiral Le Minh Thanh. He was speaking at a press conference yesterday in Phu Quoc. The announcement came after a transport official said that they had suspended search operations following reports that the plane was last spotted over the Straits of Malacca. Nine aircraft and numerous naval vessels were involved in the search yesterday. However, no traces of the plane have been found. Viet Nam is helping in the search, along with other countries. Involved countries such as Malaysia, Singapore, China, the US and Thailand had dispatched 14 planes and 22 vessels to the hunt. Meanwhile, Malaysia has been accused by the international community of providing "insufficient information", leading to difficulties in finding the aircraft. Its disappearance has remained a mystery. Deputy chief of the Office of the National Committee for Search and Rescue Col. Vu The Chien also said yesterday that Viet Nam had not yet received any official information from Malaysia on a report that the Malaysian army has tracked signals of the lost plane over the Strait of Malacca, far from where it last contacted with the civilian air traffic control. Security officials are intensifying their checks inside and around the Ha Noi-based Noi Bai international airport, so as to ensure safety and order at the country's major border gate. Vietnamese earth-observing satellite, has not yet detected any unusual images in the south-west of Tho Chu Island where the Malaysian Airlines Flight MH370 is suspected to have gone missing. Chu Xuan Huy from the Centre for Control and Exploitation of small satellite under the Viet Nam Academy of Science and Technology (VAST) furnished the information yesterday, after analysing 16 photographs sent from the satellite during the early hours of the day.